According to the USGS (United States Geological Survey) there are several million earthquakes every year in the world and of those approximately only twenty percent will be large enough to be felt by humans and only around 100 of them will be large enough to cause damage. Though you might not be aware of it the earth is moving underneath your feet everyday. If that's not enough to send you heading towards the martini shaker I don't know what is! 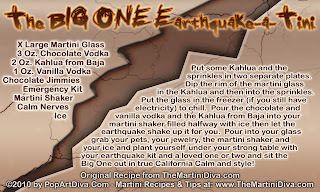 BTW, today is also National Pretzel Day - so grab a bag of pretzels to go with your Big One Earthquake-A-Tini and make sure you have your Earthquake Survival Kit packed and up to date!